Even in the aftermath of two recessions, most states amassed sufficient revenue between fiscal years 2003 and 2017 to cover their expenses. But total revenue in 10 states fell short, jeopardizing their long-term fiscal flexibility and pushing off to future taxpayers some past costs for operating government and providing services. A look beyond states’ budgets at a fuller accounting of their financial activities shows that New Jersey has accumulated the largest gap between its revenue and annual bills. Between fiscal 2003 and 2017, it took in enough to cover just 91.3 percent of its expenses—the smallest percentage of any state. Meanwhile, Alaska collected 135.9 percent, yielding the largest surplus. The typical state’s revenue, composed primarily of taxes and federal grants, totaled 102.1 percent of its annual bills over the past 15 years—a time frame that spans two economic recoveries and the Great Recession. 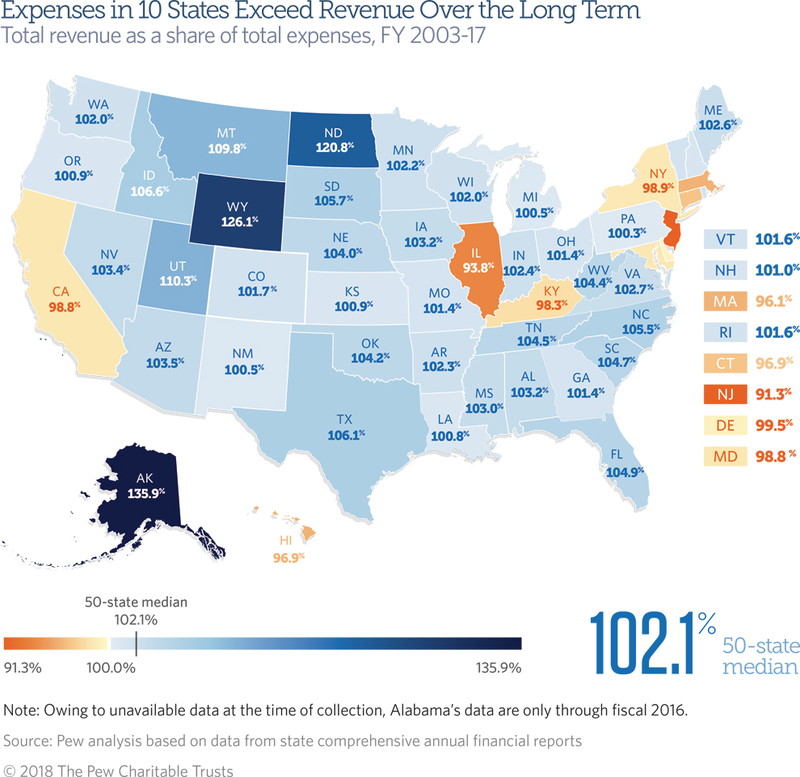 Although most states collected more than enough aggregate revenue to cover aggregate expenses, the 10 states that had a deficit—or a negative fiscal balance—carried forward deferred costs of past services, including debt and unfunded public employee retirement liabilities, which could constrain their future fiscal options. The latest results, adding data for fiscal 2017, decreased by one the number of states with aggregate deficits over the long term. This fuller picture of states’ financial activities—capturing all but those for legally separate auxiliary organizations, such as economic development authorities or some universities—is drawn from their audited comprehensive annual financial reports (CAFRs). These reports attribute revenue to the year it is earned, regardless of when it is received, and expenses to the year incurred, even if some bills are deferred or left partially unpaid. This system of “accrual accounting” offers a different perspective of state finances than budgets, which generally track cash as it is received and paid out. Accrual accounting captures deficits that can be papered over in the state budget process, even when balance requirements are met, such as by accelerating certain tax collections or postponing payments to balance the books. This analysis begins with fiscal 2003 because 15 years of expense and revenue data offer a long-term view that is still relevant to present-day decision-making. Fiscal 2002 was the first year that accounting standards required states to report accrual information for the entire government. New Jersey had the largest deficit, with aggregate revenue able to cover only 91.3 percent of aggregate expenses, followed by Illinois (93.8 percent). They were the only two states with aggregate shortfalls exceeding 5 percent of total expenses, and the only ones with annual deficits in each of the 15 years. Additional states with symptoms of structural deficits were Massachusetts (96.1 percent), Hawaii and Connecticut (both 96.9 percent), Kentucky (98.3 percent), California and Maryland (both 98.8 percent), New York (98.9 percent), and Delaware (99.5 percent). All but California and Delaware experienced deficits in at least 10 of the 15 years. In fiscal 2017, Delaware’s largest deficit in eight years pulled its long-term fiscal balance into negative territory. It was the only state to move from a positive to a negative long-term fiscal balance. Two states’ long-term balances improved from negative to positive. After seven consecutive years of surpluses, Michigan’s aggregate revenue edged up to 100.5 percent of its expenses for the past 15 years. New Mexico also climbed into a positive fiscal balance with 15-year revenue equal to 100.5 percent of expenses, thanks to a surplus in fiscal 2017. The largest accumulated surpluses since fiscal 2003 were in Alaska (135.9 percent), Wyoming (126.1 percent), North Dakota (120.8 percent), Utah (110.3 percent), and Montana (109.8 percent). Resource-rich states use some of the large surpluses they acquire in boom years to help cushion shortfalls when oil or mining revenue declines. Looking at states’ balances year by year, shortfalls mainly occurred during and immediately after the economic downturns of 2001 and 2007-09, suggesting that most states’ challenges were temporary. For example, all but Louisiana, Montana, North Dakota, and West Virginia ran deficits in fiscal 2009, the nadir of the Great Recession. As the nation’s economic recovery took hold, a majority of states balanced their books and have kept them in the black since fiscal 2011. However, in fiscal 2016 and 2017, more than a dozen states ran deficits. One reason was stagnant tax revenue growth, which through the second quarter of 2017 had its weakest two-year stretch—outside of a recession—in at least 30 years. Throughout much of fiscal 2016 and 2017, tax collections were stymied in certain states by sagging energy and crop prices, and more widely by slow wage growth and a migration of consumer spending toward services and online purchases that were less likely to be taxed. Among the 10 states with gaps between aggregate revenue and expenses in fiscal 2003 to 2017, a year-by-year breakdown shows that at least one has recently turned a corner and begun reporting surpluses: California has produced a surplus for the past five fiscal years. Examining aggregate revenue as a share of aggregate expenses—that is, all revenue and all expenses from fiscal 2003 to 2017, each adjusted for inflation—provides a long-term perspective that transcends temporary ups and downs. This approach allows surplus funds collected in flush years to balance out shortfalls in others. Download the data to see individual states’ inflation-adjusted revenue and expenses for each fiscal year from 2003 to 2017. Visit Pew’s interactive resource Fiscal 50: State Trends and Analysis to sort and analyze data for other indicators of states’ fiscal health.